We're going on a lion hunt. We're going to catch a big one. We're not scared. 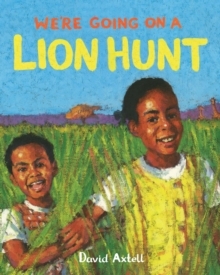 In David Axtell's beautifully illustrated rendition of a well-known children's poem, two sisters are out looking for a lion - a lion that lives on the African savanna. The girls go through swishy swashy long grass, a splishy splashy lake, and a Big Dark Cave. When they finally meet their lion, they have to run, run, run through it all again to get back home. With illustrations bursting with magnificent animals, little adventurers would love journeying through this African savanna.